Super Featherweight Alycia Baumgardner, of Fremont, Ohio, quickly lived up to the expectations created after being named The Ring magazine’s 2018 Female Prospect of the Year. Last February, she ventured east to Philadelphia and fought her way to a wide unanimous decision victory over veteran Nydia Feliciano. With the win she became the WBC International champion – in just five fights. What was next for one of only two females on the Real Deal Sports & Entertainment roster? Two months later, in Louisville, Kentucky, she won a split decision versus a slightly more experienced opponent in southpaw Kirstie Simmons. She returned to Louisville in July and suffered her first defeat in a highly contested eight-rounder with 30-year old Christina Linardatou. This time the split decision wasn’t in Baumgardner’s favor, and unbeknownst to her at the time was the fact that the loss was where her story as a fighter would linger for the next seven months. Baumgardner (6-1, 4 KOs) returns to action Saturday, February 23 at the Performance Arts Center in Dearborn, Michigan on Second 2 None Promotions‘ Best of Tomorrow 6 card. 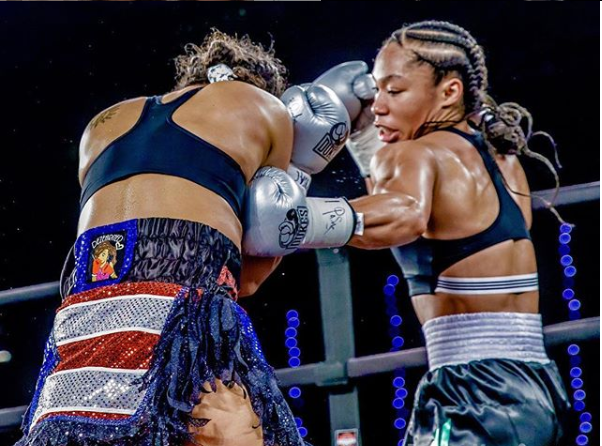 In a recent interview on Team Left Jab Radio’s Bite Down Boxing podcast, Baumgardner’s renewed motivation was palpable as she spoke about her mindset and preparations entering her fight with Rolanda Andrews (9-8-1, 4 KOs). “You have myself, Tiara Brown, and like you mentioned Mikaela Mayer. I think that those are fights that could be made, and could be televised and well promoted if given the chance. Baumgardner further discussed up her coming fight, expressed her thoughts on her relationship with Adidas boxing, talked about her commitment to her training the past seven months, and closed with her reaction to the outcome of mid-January’s Manny Pacquiao vs Adrien Broner Welterweight title fight. Regarding the upcoming The Best of Tomorrow 6 event, Detroit-area fight fans can also catch scheduled fights featuring familiar fighters like James Smith, Jafar Mohammad, Joseph Bonas, Anthony Flagg and more in action. Inquire about tickets and prices at 248-599-1095, or for daily updates visit the S2N Second 2 None Promotions page on Facebook.